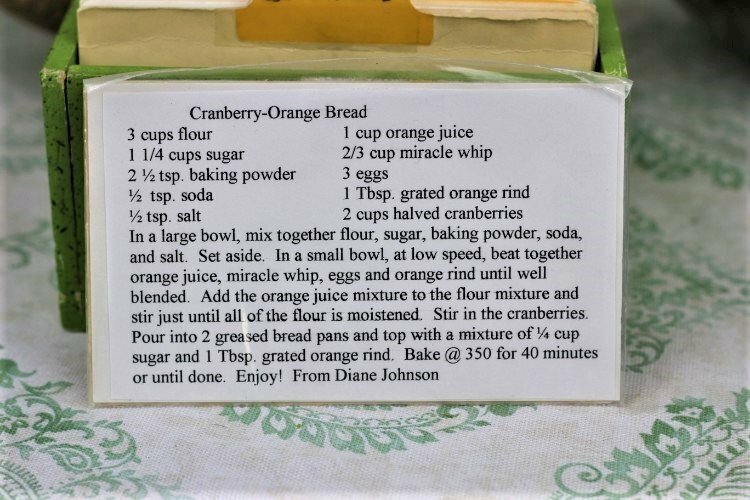 Front of the recipe card for Cranberry Orange Bread. There is a notation that this recipe is from Diane Johnson, who I do not know who she is at this time. There are lots of fun recipes to read in the box this recipe for Cranberry Orange Bread was with. Click here to view all of Vintage Recipe Box 95 recipes. Use the links below to view other recipes similar to this Cranberry Orange Bread recipe. 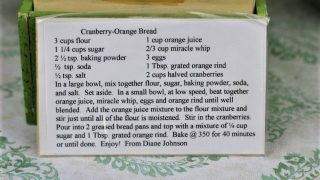 If you make this Cranberry Orange Bread recipe, please share your photos and comments below! In a large bowl, mix together flour, sugar, baking powder, soda, and salt. In a small bowl, at low speed, beat together orange juice, miracle whip, eggs and orange rind until well blended. Add the orange juice mixture to the flour mixture and stir just until all of the flour is moistened. Bake @ 350 for 40 minutes or until done. Enjoy!